DIT DSO provides help and support to UK defence and security exporters at 2017 DPRTE. The DIT DSO knowledge transfer zone attracted over 230 delegates throughout the day. 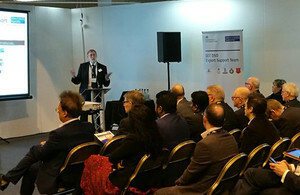 The 2017 Defence Procurement, Research, Technology and Exportability (DPRTE) conference and exhibition, took place at the Motorpoint Arena, Cardiff on 28 March. Department for International Trade Defence and Security Organisation (DIT DSO) is a main partner in this highly successful annual event. This event gave DIT DSO an excellent opportunity to showcase government engagement with UK industry, in support of winning overseas defence and security business. DIT DSO offered advice, information and support from their business growth and exportability knowledge transfer zone, and more hands on support from the adjacent exhibition stand. The DIT DSO exhibition stand, staffed by members of the DIT DSO Small Business Unit, Events Team and Military Export Support Team, received a constant stream of enquiries from UK companies. Many of which were considering military and security markets as an outlet for overseas trade for the first time. Post event engagement with these companies has been significant and DPRTE remains a priority occasion for us to promote our support and services for the benefit of UK compaies. If you are interested in attending future events contact sme.enquiries@ukti.gsi.gov.uk.